Summary: You will have to be fit for this walk as the steep relentless climb to Kirk Fell from Wasdale comes soon after setting out from the car park. 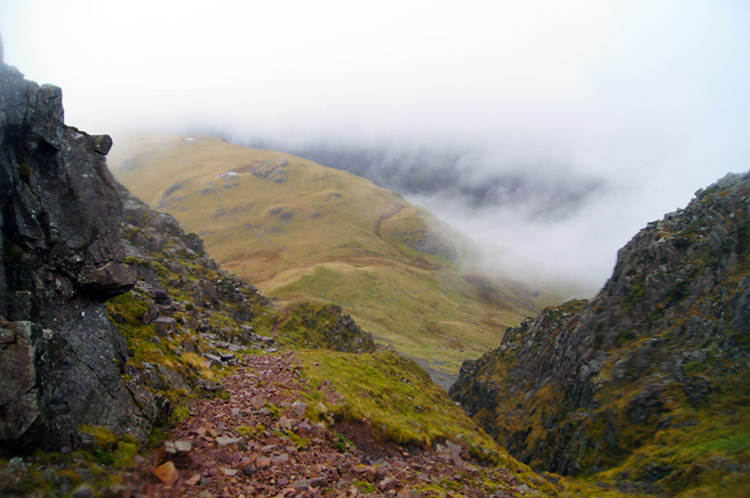 At a 50% incline the climb is a severe test and once done there is a tricky descent to Black Sail Pass via Kirkfell Crags. The rest of the walk is a doddle compared to what is done with Pillar, Steeple and Dore Head being some of the highlights of this upland classic. 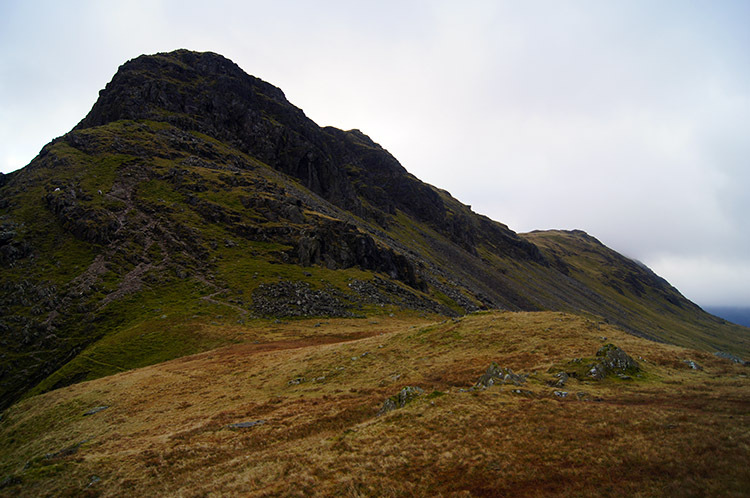 Kirk Fell had been a niggling mountain for some time, the only Wainwright mountain in the Scafell region I had not completed so as a final walk of three in a November 2013 walking break I resolved to complete it. And how would I do it? 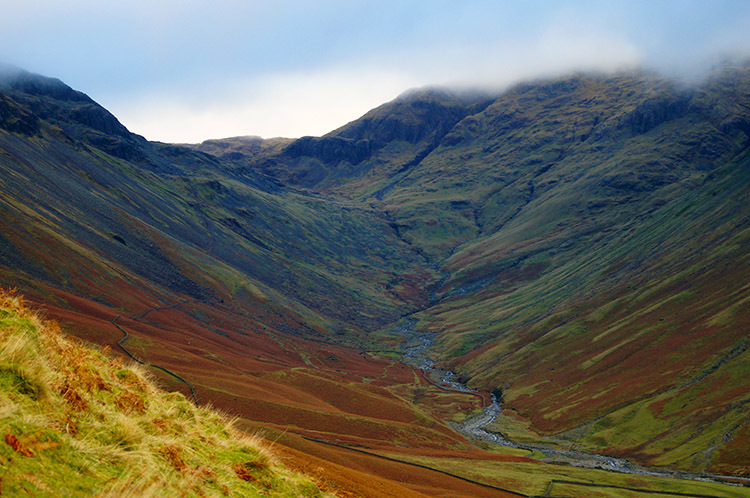 I had always looked to the path going straight up the centre of Kirk Fell from Wasdale Head when doing other walks in the area so thought "why not, it will get me straight up to the high ground". 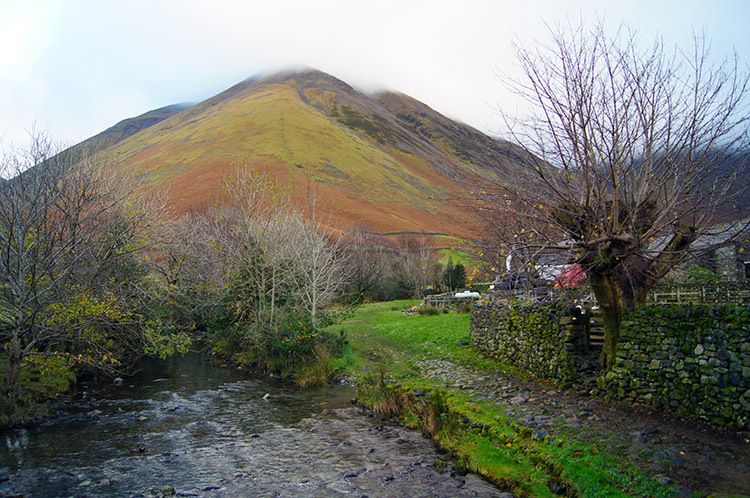 And so I began my walk from Wasdale Head, walking straight past the pub and on through the right hand gate of two to the south facing slope of Kirk Fell. The left hand gate would have taken me on through Mosedale on Black Sail Pass, the route I last took on my other version of a Mosedale Round. Once through the right hand gate I paused and looked up. I thought to myself "fifty steps and a pause, fifty steps and another pause". And so I began my routine of fifty step stages up the mountain. Each time I did so I forced myself to pause and look around until my breathing calmed. The first few pauses were very brief; I was keen to climb but the further I gained height the more I paused to take in the unveiling views around me like those to the south east of Lingmell Beck and the slopes of Great Gable and Lingmell either side of the beck and the view due south, back to Wasdale Head and Wast Water. I continued my metronomic progress up the path. As I did so the panting got greater and the heaves of breath heavier. This mountain climbing lark never gets any easier but for me that is one of the great attractions. I love challenges and I love walking in the countryside so this agony of effort was perfect for me. I continued to force myself up towards a slightly gentler incline at Highnose Head. Once I made the easier ground I took a longer pause and actually sat for five minutes. Burnmoor Tarn had come into view and captured my attention. 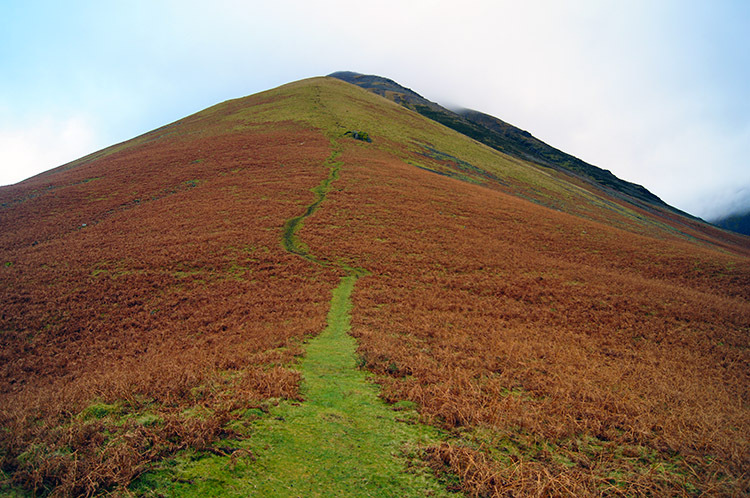 I thought "I must walk there when climbing Illgill Head and Whin Rigg". 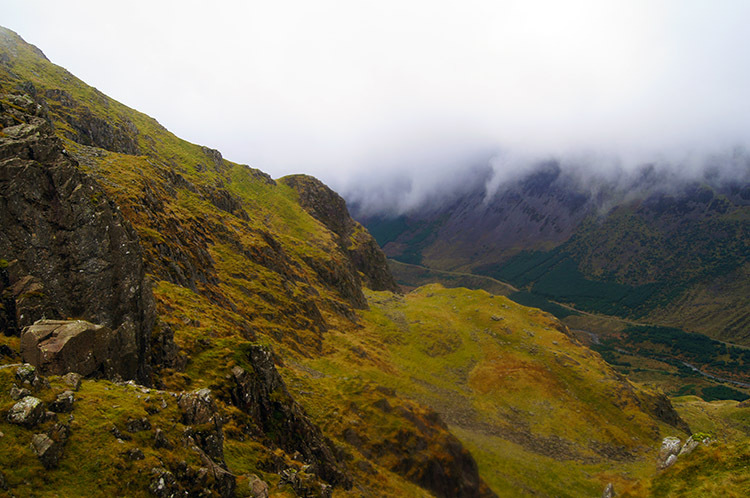 After Highnose Head I reached the cloud level and the excellent views of the mountains in the Wasdale Head area began to disappear. 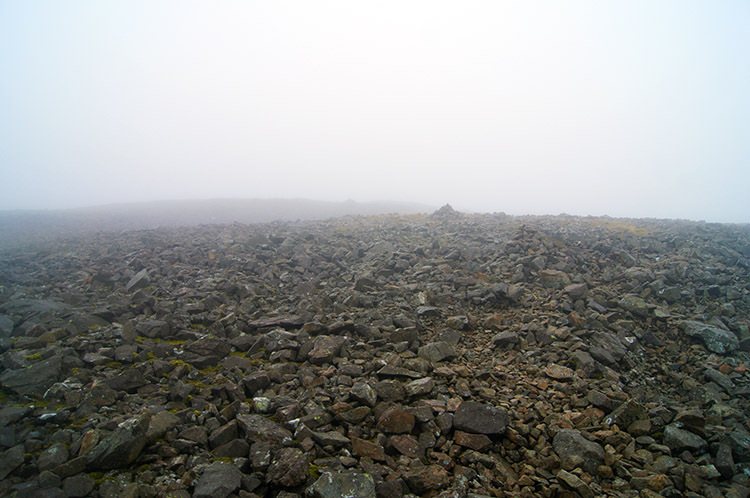 With the loss of visibility all I could do was focus on the task in hand, to reach the summit of Kirk Fell. After 600 metres height the climbing became much more difficult as my energy sapped. The long unbroken climb was telling on me and the pauses after the 50 step rule I had set myself took longer as the aching muscles in my legs recovered from each exertion. I checked the GPS after a series of hauls up and saw I had reached 700 metres height. "Drat, still 100 metres to go" I exclaimed under my breath. On looking at the contours on the map I was slightly heartened to see that after 50 of the 100 metres it would get easier. 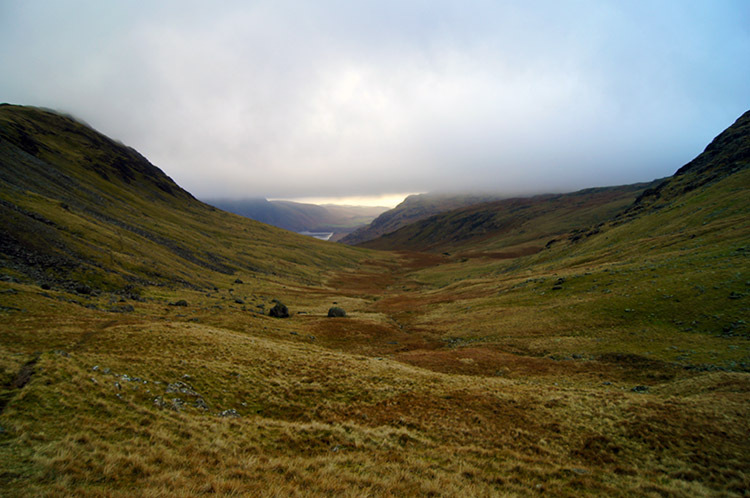 And so it did, to my relief as I walked slowly across the top plateau of Kirk Fell to the summit. Done it! It had taken me an hour and a half to walk 1.5 kilometers up Kirk Fell, not even a mile but at the same time I had climbed over 700 metres to an altitude of 802 metres. I was puffed but very proud of my efforts having reached the top but did not dwell for long as it was cold in the cloud with a chilling wind to boot. I took my bearings and followed the GPS track closely to make sure I was heading off in the right direction towards Kirkfell Crags. An additional indicator to verify I was going in the right direction was a line of iron fence posts running parallel to the path on a direct line from the summit to the crags. Just when I reached Kirkfell Crags a window of visibility through the sweeping cloud gave me the opportunity to study my route down. 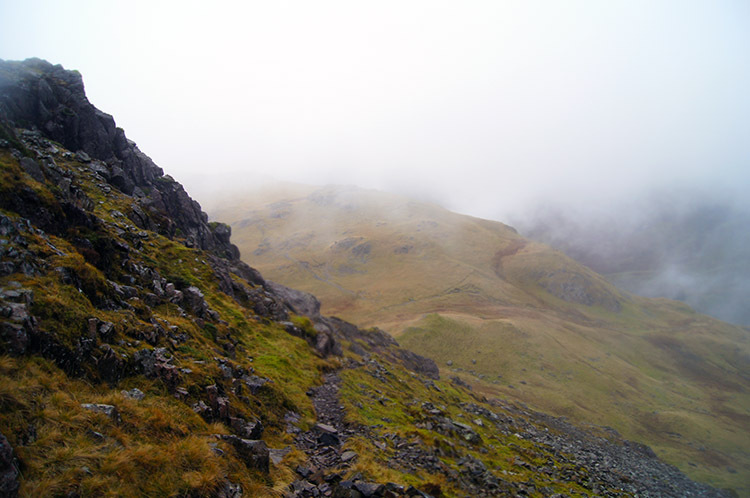 Just as well too as the climb down the centre of Kirkfell Crags was tricky. Soon after beginning my careful descent through the steeper part of the Kirkfell Crags pass I could see Black Sail Pass below me, a path I would be crossing over on my course towards Pillar. I could not think too far ahead though as concentration was required as I carefully shimmied my way down using both hands and feet to avoid falling during the steep slippery scramble down to the lower reaches of the crags. I did slip just slightly, on two occasions during a scramble down a particularly crumbly red rock gully but on both I managed to wet my gloves only and not my backside. A few minutes later I could use my hands for reading the map instead of arresting any fall and walked down to Black Sail Pass, crossing to walk the path to Looking Stead. From descending to below Kirkfell Crags, across the Black Sail Pass and on the climb back up to Looking Stead I was once again below the cloud line which levelled off at around 650 metres so I could look around and capture the views again. 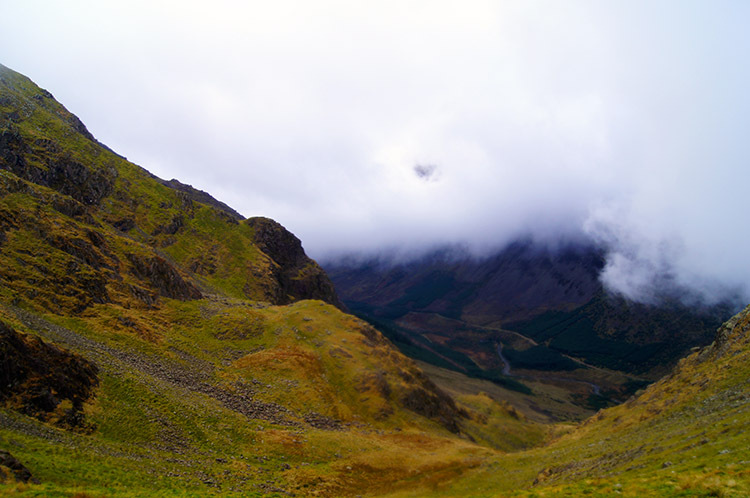 At Looking Stead I got my first look into Ennerdale when gaps in the valley cloud lower allowed me to. 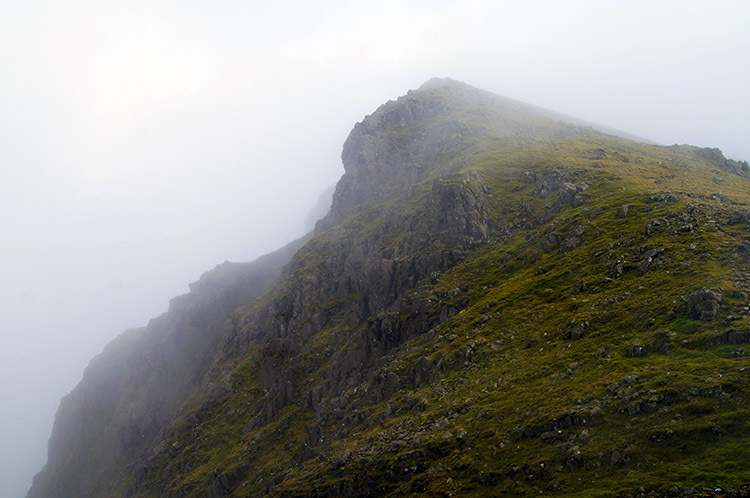 Then I looked back to Kirk Fell and saw the top of the mountain, clear of cloud. Oh how I wished it had been like that an hour earlier when I had been there. 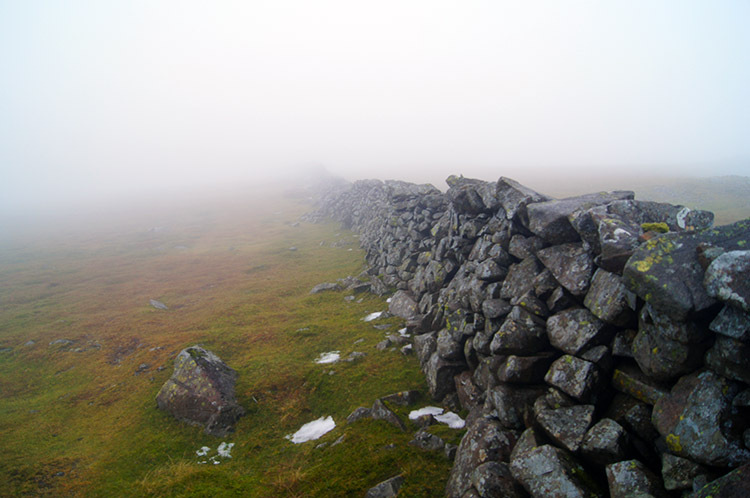 I could then have enjoyed, what Wainwright described as "a well distributed view. 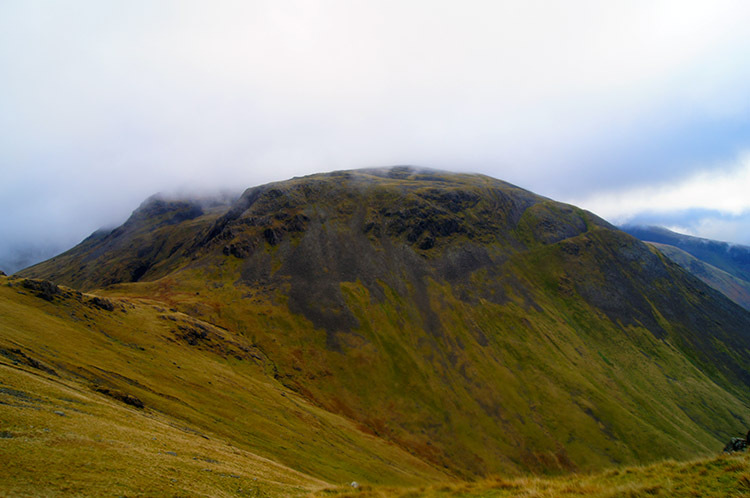 The Scafells look magnificent, and the path up the Pike from the Lingmell Col is clearly seen. Criffel appears over High Crag" Criffel is a mountain in Southern Galloway in Scotland across the Solway Firth. I wish I had seen that though I am sure I will have on other Lake District walks as I often look to the Galloway mountains and wonder. Now lets get back to the task in hand shall we? 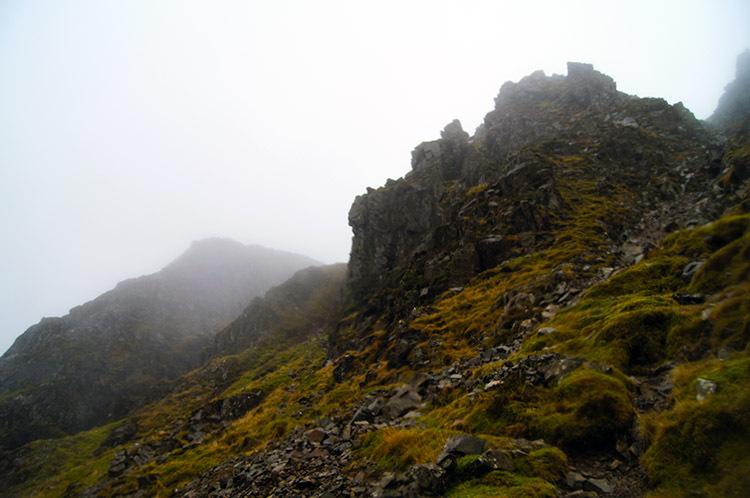 I climbed from Looking Stead and up through the craggy face of the first of a series of rock buttresses on the path guarding the east facing upper path to Pillar. Clearly the exertions of the Kirk Fell haul had sapped me more than I imagined, every climb was hard, however short, and I cursed each one I came to. 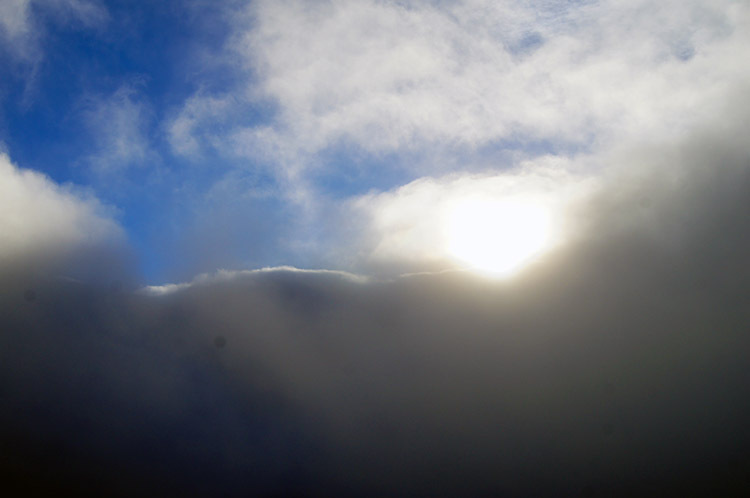 The cloud was building once more as I ascended so the rock obstacles appeared right in front of my eyes giving me no time to prepare for the next heave up. Sorry if I am making this part of the walk feel excruciating. It would normally be easy but I was just bushed at this stage and making extremely slow progress. I forced myself to stop for a short break in shelter of the cold wind and took in some well needed refreshment. After my refreshment just short of the summit of Pillar I took to my feet again and with a little more energy I scampered up to the trig point on the summit of Pillar. 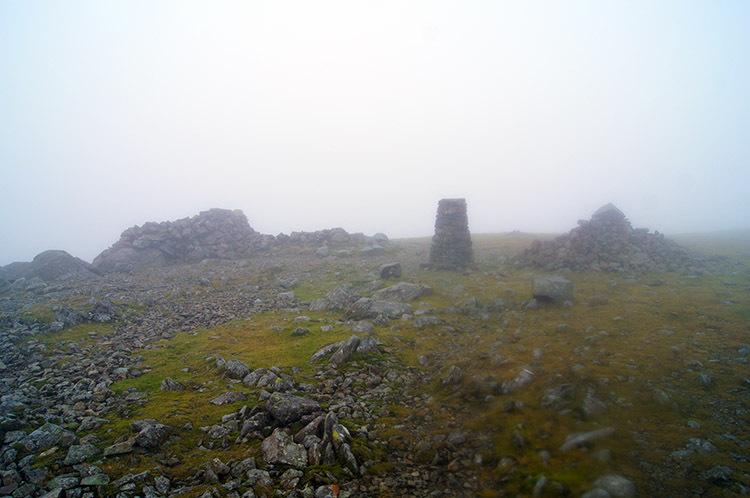 I renewed my acquaintance with the summit and then dived into a summit shelter for another short break. It was perishing cold and I was the only person on Pillar - very alone on a mountain that is usually busy. Then again it was a cold final Thursday in November so I did not exactly expect crowds - but nobody else about at all? That did surprise me. I huddled in my personal shelter, as that what it was for this day, until again it was time to move on. From Pillar my next objective was Steeple, only a short walk from Pillar but a tricky one indeed as the descent on the path down to Wind Gap can be treacherous. 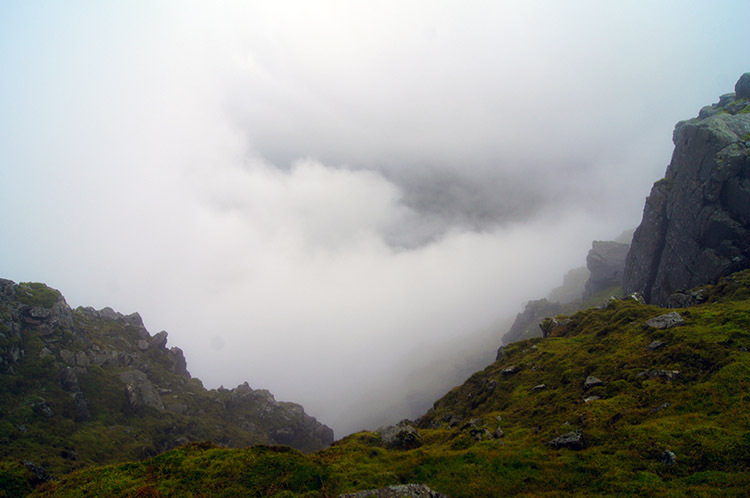 And as I was now in full cloud it was also a challenge to keep on the right path as it skewed steeply down the loose rocky slope. I was glad to reach Wind Gap and get the descent out of the way. After Wind Gap it was a short stiff climb to Scoat Fell, a welcome bowl of near levelness strewn with rocks everywhere. Despite the easier ground though the path disappeared so I was heartened to see a drystone wall which I could follow to Steeple. 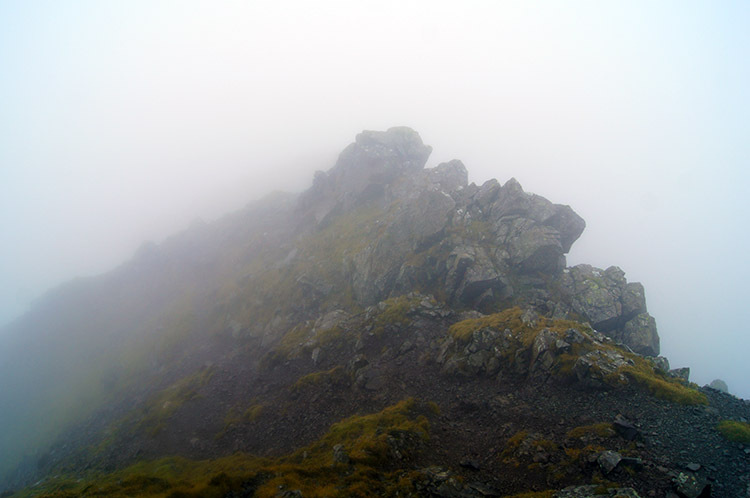 When I got there there was still no view so I imagined Wainwrights words once more. Of Steeples summit he said "This is a thrilling spot. One's feet are on the ground but one's eyes see as from a cloud in the heavens" well, I was certainly in the cloud, that was for sure. I could not see a thing and I could have looked across to a wonderful profile of Green Gable, Great Gable and Kirk Fell. My plans at the start of the day had been to climb Kirk Fell, cross to Looking Stead, then up to Pillar and across to Steeple. All well and good but from here I had planned in Haycock and Seatallan. I looked at the time though and deemed that plan as not having a chance. 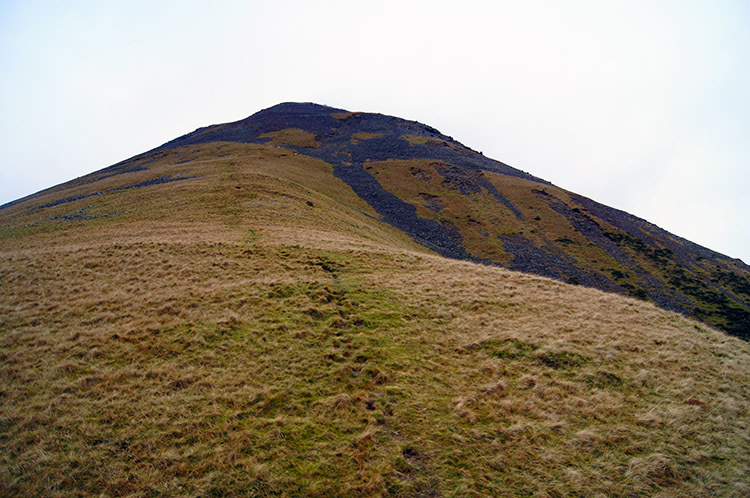 It was nearing 2.0pm and I had only two remaining hours of daylight so I re-planned my course and decided to track down the path due south to Red Pike and Dore Head, a path I knew from my last Mosedale adventure and the only sensible option remaining. 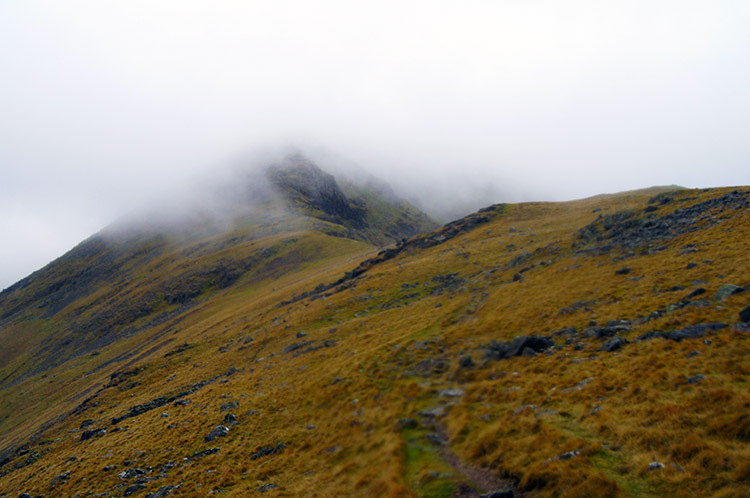 I scampered off from Steeple and Scoat Fell at quite a pace. 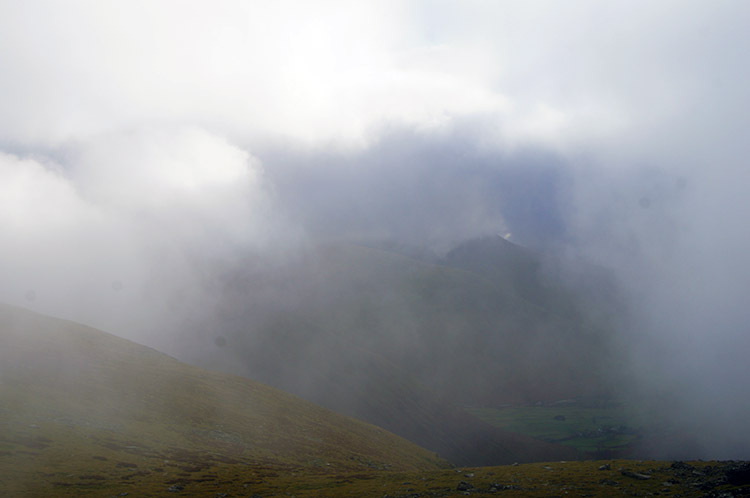 As soon as I reached and passed Red Pike and descended to under 800 metres the sun broke through the cloud and opened out the views for me once more. I was uplifted immediately when the views returned to me. 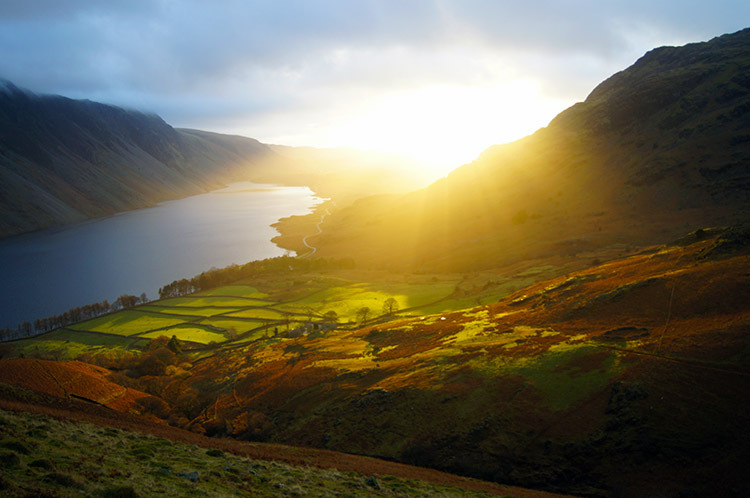 I focused my eyes on Dore Head and the inspirational profile of Yewbarrow, a favourite of mine. 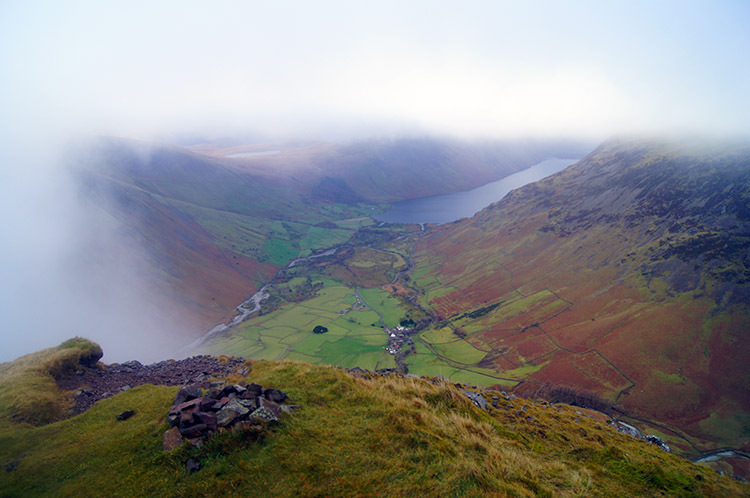 I quite bounded down to Dore Head and down to Stirrup Crag on the north west face of Yewbarrow. 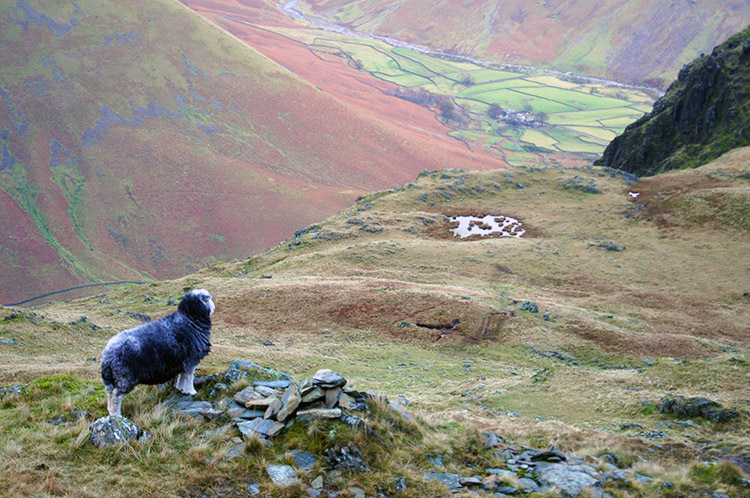 On the descent I stopped and stood with a sheep to admire the view, a moment of mutual appreciation. We both showed we had good taste in the wonderful Lake District landscape. At least I could imagine so. Then when I stood just below Stirrup Crag I made a critical decision. I was tempted to descent the short cut route to Wasdale Head via the Dorehead Screes. However I chose not to, instead taking the longer but safer route around the south side of Yewbarrow to Overbeck Bridge. I walked through Over Beck Dale with it all to myself. The view was lovely and the mood evocative. I really felt like a very lucky person with all the beauty around me to myself. 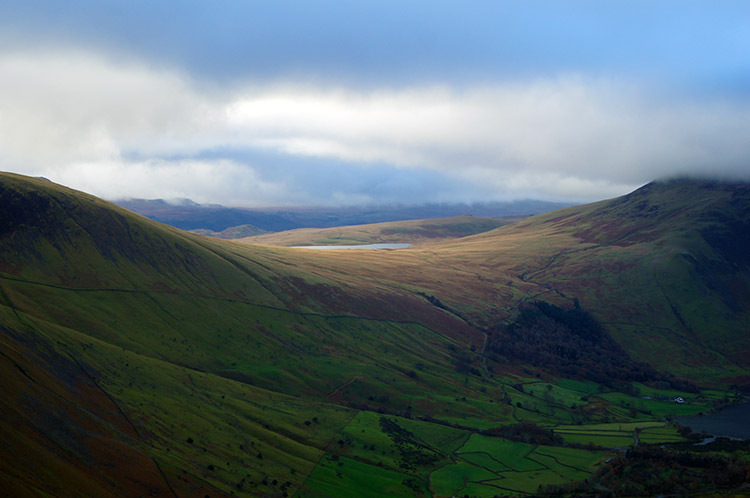 And as I walked south through the dale between Yewbarrow to the east and High Fell to the west the late afternoon began to fade into evening light. 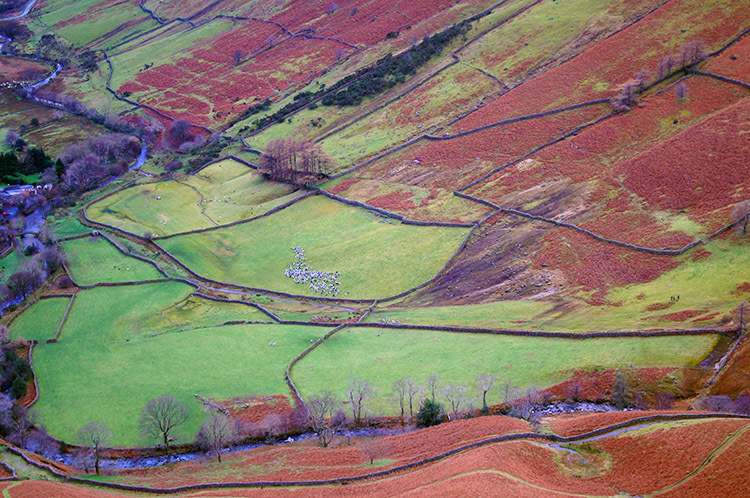 As it did so I knew I had made the right decision to curtail the planned walk at Scoat Fell. Haycock and Seatallan would have caused me to venture into the dark, not a favourable situation. 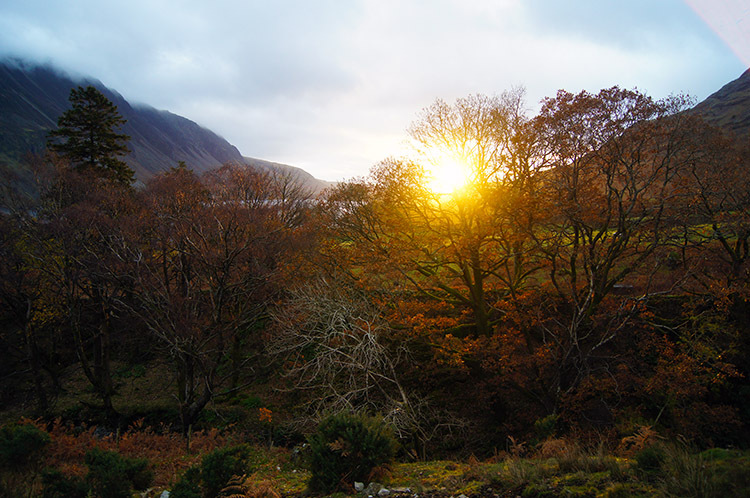 And then I realised I had definitely made the right decision as the setting sun provided Wasdale with a beautiful and somewhat surreal blanket of evening sun. I was beguiled as I viewed the transformational changes of mood caused by the dwindling light as I walked from Dropping Crag down towards Overdale Bridge. As I scampered down the final field to Overdale Bridge the sun gave me a final flourish through the now leafless tree line. It was a final fillip for me to enjoy before I reached the Wasdale Head road and tracked along it for the final couple of miles back to the Wasdale Head car park. 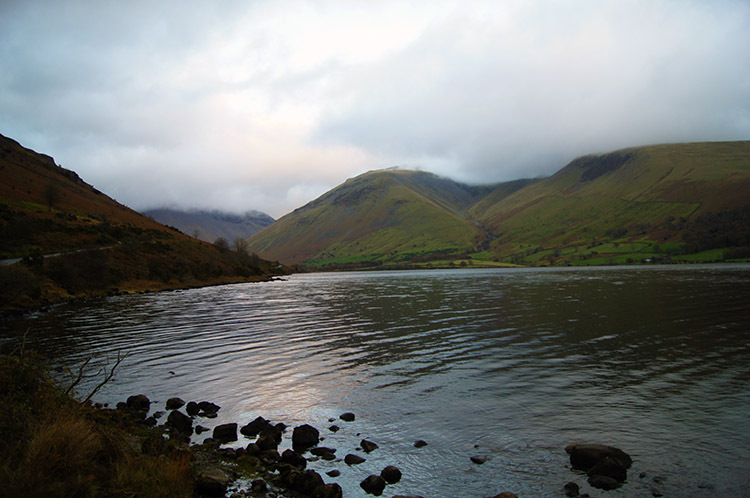 I made a few short stops to take photographs, some of Wast Water in the evening light, and between the photo stops I walked at a good pace as light gave way to dark. And it was just about properly dark when I reached the car - just in time. I paused for a while to drink the final cup of soup from my flask and then changed to drive off. When I did so I contemplated on a great day out, tiring but fulfilling. Despite the steep climb at the start up Kirk Fell which fatigued me for the rest of the climbing during the walk and despite the infuriating cloud which robbed me of views on Kirk Fell, Pillar and Steeple I will always look back on this walk with particular satisfaction.